Artist like Michelangelo and Picasso were truly sparks for an era, catalyzing sweeping changes with their creativity and vision. Occasionally in art history we find brilliant, creative artists who stood out as unique individuals in their era but remain isolated from prevailing and subsequent artistic trends. 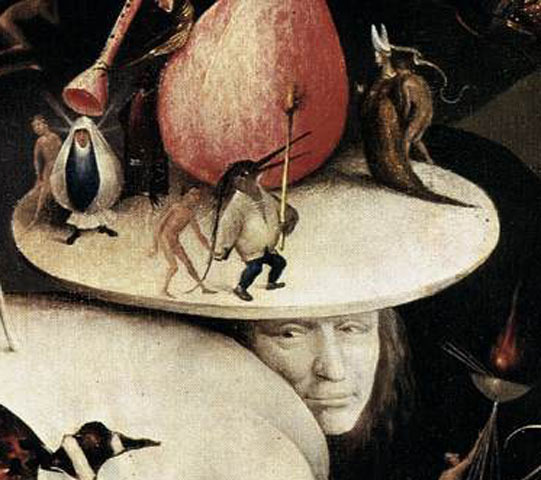 No one represents this more for me than Hieronymus Bosch whose bizarre, complex and wholly singular style stands out among the stars of the Northern Renaissance. Little biographical information is known of Bosch (1450-1516) but it is believed he learned to paint from a family member. 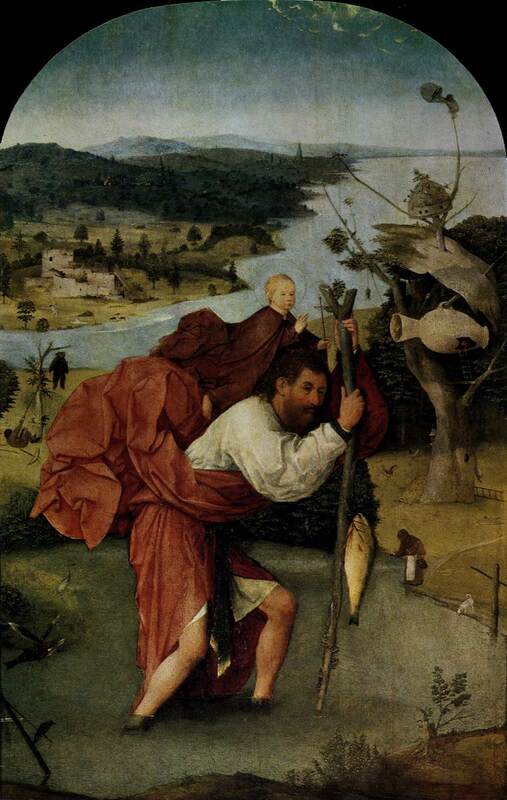 Some of his works mimic the smooth figures and tranquil landscapes of typical early Dutch art such as in St. Christopher above. However, his imagination eventually prevailed and Bosch’s paintings and drawings became filled with monsters and mysterious creatures in strange scenarios. The subject matter of the painting are not just pure fantasy but pull from religious and moral themes, albeit depicted in a wholly unique way. Bosch’s paintings are incredibly detailed and beckon viewers to examine ever single figure. The damned have long been hounded by devils in European Last Judgement scenes, but only Bosch created platypus-faced and walking head monsters who carry souls like wild game. Detail from “Last Judgement Triptych” Akademie der bildenden Künste, Vienna. Two monstrous cooks prepare the greedy in this detail from “Last Judgement Triptych” Akademie der bildenden Künste, Vienna. 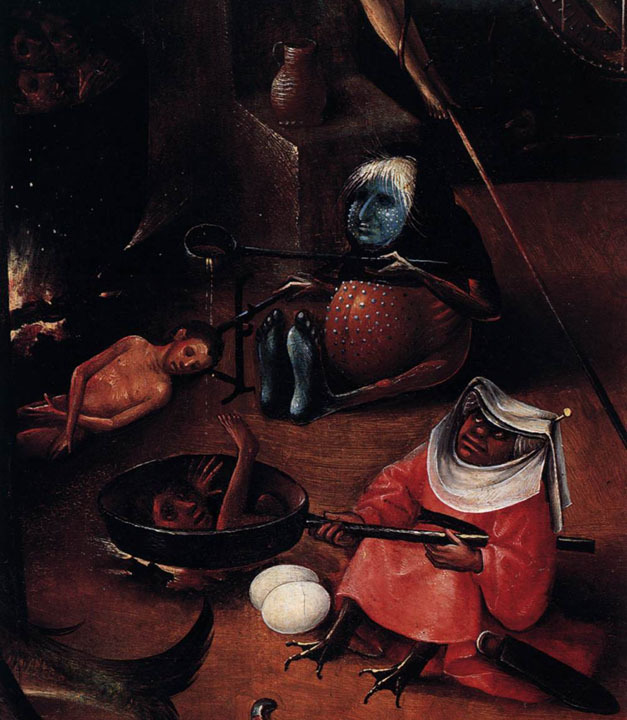 I think its easy to see a painting by Bosch and assume that his work was too outlandish to be accepted by contemporaries who were use to serene religious themes. However, I think this is unfair. Bosch’s paintings make sense in the context of incredibly vivid Medieval morality plays. 15th century Europeans watched folk plays in which the devil commonly appeared and interacted with humans. The immoral were punished in accordance with their crimes as we see in Dante’s Inferno, while Just and Good were aided by angels. In this way, demons, monsters, angels and fundamental moral themes would have been easily recognized and understood by contemporary viewers. In “Death and the Miser” at the National Gallery of Art in DC, we see rat-faced demons encouraging the hoarding of money while an angel petitions for the man’s salvation at the hour of Death’s arrival. Likewise the Book of Revelation with its vivid imagery of the Apocalypse was coming into popularity so huge, fantastic but religious imagery was not outside one’s conscience. Only 25 paintings have been attributed to Hieronymus Bosch. The largest collection of which reside at the Prado Museum in Madrid, but there are singular pieces scattered throughout the great museums of Europe. His most famous piece is “The Garden of Earthly Delights.” While executed as a Triptych of Eden, Earth and Hell, it was probably meant for viewing in a residential rather than religious setting. Books have been written trying to unlock the religious and folklore symbolism in this incredibly complex piece. Have a look yourself and see what pops out at you! With any luck, you might find something odd and entertaining, if not also a moral instructive. Brilliant piece, & a pithy summary of an endlessly intriguing & complex artist. Thank you. His work has always stunned me with his endless imagination and so many characters and creatures. Before I learned anything about his work I had assumed that it was the work of a surrealist with the combination of religious imagery, futuristic looking architecture and odd dream-like monsters. The Surrealist were the artists who finally embraced Bosch and developed the style from there. Hard to imagine a single artist inspiring a movement ~500 years later! He really was unique and creative. How truly fascinating!! While I am familiar with the “Garden of Earthly Delights,” I have never seen some of the other imaginative works that bring his macabre world to life for the viewer! Outstanding post!! Thanks Jeff! That’s understandable, Bosch has so few works (comparatively) and “Garden of Earthly Delights” is really a masterpiece. Glad I could share! Bosch is one of those artists I always seek out in museums. His work is so intriguing. I always marveled at his incomparable imagination but what you mention about Medival morality plays makes perfect sense. Thanks for an enlightening post. Thanks Sedef! I still have to give Bosch credit for a lot of his “monsters” but it helps to understand how this art would have resonated with viewers. That’s a great point about being a witness. The amount of detail and the elaborate composition does make it seem like Bosch is just recreating a terrible dream he had. Gah! I love Bosch! To me, his work takes medieval marginalia from the edges and puts it front and center but executed in an early Northern Renaissance medium. As a kid, I would stare at the plate of The Garden of Earthly Delights in her old college art history books for what seemed like hours. So when are you going to Madrid again? 😉 That will be a serious art pilgrimage!